Sure Lionel Messi got the trophy at Monday’s Ballon d’Or ceremony, but that was about all the Argentine won. Who were the cameras focused on when Leo was making his acceptance speech? Cristiano Ronaldo. Who was linked with a move to soon-to-be European Powerhouse Paris Saint-Germain after the awards had been dished out? Cristiano Ronaldo. Who immediately had a plethora of internet memes dedicated to his gorgeous face? Cristiano Ronaldo. Who was the one immediately back in action on Wednesday hitting a superb hat-trick against Celta Vigo? Cristiano Ronaldo. Whose team did Messi claim could overhaul Barcelona’s huge La Liga lead after the ceremony? Cristiano Ronaldo. Who was hailed as “the complete player” this week by Sir Alex Ferguson? Cristiano Ronaldo. Who has immediately moved on from all this individual award nonsense and is eyeing a Champions League triumph with his side? Cristiano Ronaldo. Who was wearing a suit that made him look like an extra out of a 1980s Peter Gabriel video? Lionel Messi. 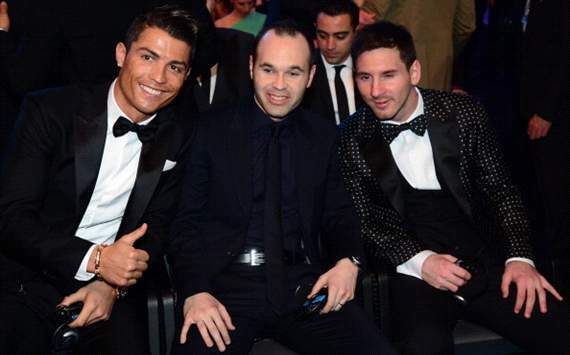 Who remembered Andres Iniesta? Anyone? It took some hard work, some hard bargaining and some hardly-believable finishing, but Theo Walcott agreed a new deal with the Gunners this week, securing financial security for himself and a free run at the top of the shop at Arsenal. After months of tireless dodging of questions in interviews and actually having to play an extended run of games, the England man can deservedly get his feet up now and knock off for, say… a couple of years. The money’s in the bank, so Theo will have to turn his attentions to which car to pick out, and decide which of his snap-back caps he will be wearing on each day, tough work with no time for football. Think of the effort Walcott has put in so far this season, chasing defenders, dribbling on the pitch, kicking the ball in the right direction, it has clearly been a physically exhausting time, but also a mentally exhausting one – given how decisively indecisive he had been before three months ago, the 23-year-old has been concentrating harder than a meditating monk in a statistics exam. WWLTW has some simple advice for the attacker – get your feet up, take it easy and if you do end up on the pitch, you can always say you’re demanding to be played as the next Dimitar Berbatov. For the good of the English game, Bradford City cannot win the Capital One Cup. The Premier League has taken a battering on the continent in recent years, with Manchester City bottling things two years in a row, Chelsea miserably failing to retain their Champions League crown and Arsenal competing in the knock-out stages, despite standing no chance of beating anybody good. It might only be the Europa League that the Bantams qualify for when they do beat Swansea at Wembley in February, but the 16-1 spanking that they will receive at the hands of Dinamo Tbilisi will be another body-blow that our game cannot afford to take. Miguel Michu. This country needs YOU. This entry was posted in Club news on 11/01/2013 by mirsinho.